On Monday, the Charter Revision Commission held its latest meeting, where its members called for a series of five panels to better inform their decision on what, if any, issues to put on the ballot this fall—or next, more on that in a moment. One of the five panels that was called for was on land-use reform, the best indication yet that the commission may well perform the major overhauls the city's developers and planners have been calling for, as we noted in a recent issue. The commissioned announced today that the land-use panel will be held June 24, at the Flushing branch of the Queens Library, and in addition to experts, public input will also be taken. So if this is an issue you care deeply about—be honest, who doesn't love ULURP?—then we'll see you there. As for this fall or next, the biggest debate remains not what but when the commission will conclude its work, as some commissioners and members of the public insist it is moving too quickly to fully engage all the necessary issues. With snowpocalypse about to descend on the city, summer feels a long way away. 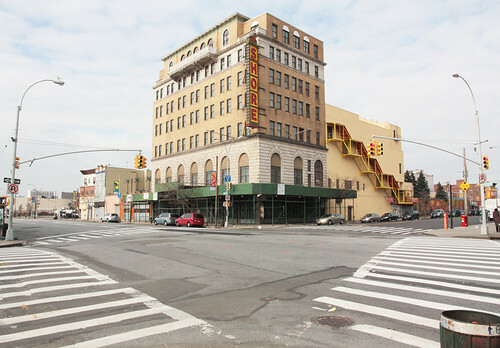 But there is cause for sun-soaked celebration today, as the Landmarks Preservation commission calendared the Shore Theater, the first step in the public review process to make the building an official city landmark. The calendaring is actually the first fruits to bear from the Bloomberg administration's 13th hour deal with developer Joe Sitt. It will be months before amusements return to a saved Coney Island, but a major negotiating point for the community—and the amusement community in particular—was more landmarks in Coney to protect the area's historic buildings from the flood of development the city's rezoning hopes to create. So far, there are no other buildings in the docket besides the 1920s theater-and-hotel building, though, which could be cause for concern—especially after the area's oldest building recently suffered water damage. Still, after decades of deterioration, any progress is good. In other landmarks news... 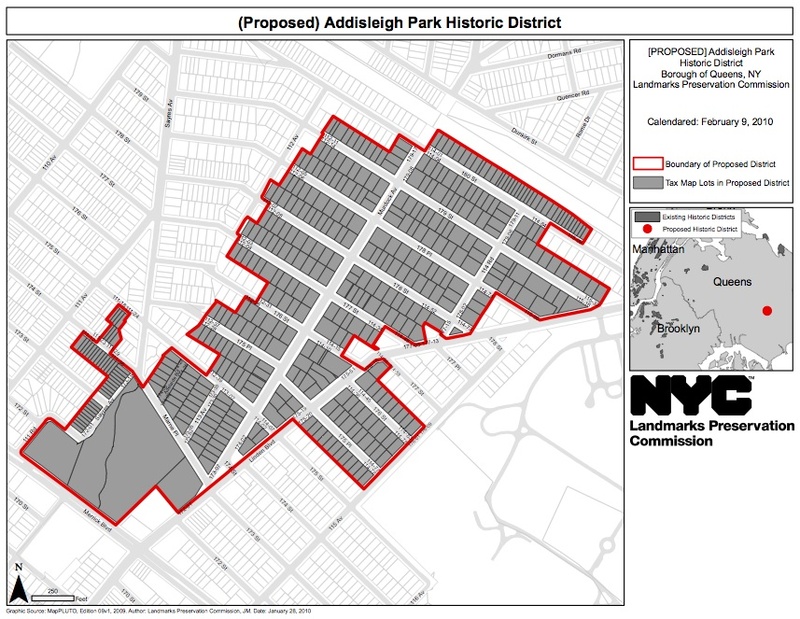 The commission also calendared today the Gramercy House and the Addisleigh Park Historic District. The former is an apartment building on East 22nd Street designed by Edward and Charles Blum in 1929 and completed in 1931. The building, according to the commission report, boasts "textured brickwork, contrasting base and striking polychrome terra cotta trim." Meanwhile, the latest proposed historic district (the 101st?) is located in Queens and comprised of 426 buildings, the St. Albans Congregational church and its campus, and 11 acres of St. Albans Park. Many of the buildings date from the 1910s to 1930s, and according to this page on the Historic Districts Council's website, the area was an enclave in the 1950s for the city's well-to-do blacks, including Jackie Robinson, W.E.B. DuBois, Count Basie, Joe Louis, and Ella Fitzgerald, among other notables. Here's a map of the area, and you can see it in GoogleMaps here. Finally, the commission voted in favor of two new landmarks today. The Penn Club, formerly the Yale Club, is located on 44th Street between 5th and 6th avenues, near a clutch of other robber baron-era clubhouses. The 11-story building was completed in 1901 on commission from Yale, with designs by two Yalies and McKim, Mead, & White alums, Evarts Tracy and Egerton Swartwout. The building was later acquired by Penn. The other new landmarks is the 143 Allen Street House, which was built around 1830 for ship captain George Sutton, a time, as the commission report notes, "when the Lower East Side was a fashionable residential district." And so the circle is complete. These two buildings also had hearings the same day as Paul Rudolph's 23 Beekman Place, so it's quite possible that building could be coming up for a vote in the near future as well. It appears the city's plan to trifurcate development out at Willets Point has been a smashing success, as the Economic Development Corporation announced on Friday that 29 developers from across the country have expressed interest in the first phase of the project, an 18-acre swath of land on the western section of the 62-acre Iron Triangle that contains the densest mix of uses. “The quantity and quality of these responses are strong indicators that the development community has confidence in the successful redevelopment of Willets Point despite current economic conditions,” Seth Pinsky, president of EDC, said in a release. An RFP is expected sometime in 2010 for a selection of those 29 respondents. After that, the next hurdle is finishing land acquisition, which stands at 75 percent of the phase one area controlled by the city. If need be, the city has not ruled out acquiring what's left through eminent domain, a specter that has cast a long shadow over the area's redevelopment, though one that could be sunsetting. Following a court ruling that the state could not seize land in the Manhattanville section of Harlem so that Columbia could build a new campus there, Atlantic Yards opponents are hustling to have their ultimately unsuccessful case reheard, a last-ditch effort to impede the sale of Forest City Ratner's bonds. Whether or not they succeed, all this eminent domain tumult—combined with the recent collapse of plans for the Mother of Them All in New London, Connecticut—could nudge New York over the edge, taking it off the list of a handful of states that have yet to enact eminent domain reform since the Kelo decision four years ago. State Senator Bill Perkins certainly thinks so, calling for the governor to live up to his previous promises of a moratorium on eminent domain in the state. How could this all pay out in Flushing, Queens? David Lombino, a spokesperson for EDC, emphasized the agency's strong track record on reaching deals with business owners in the area, despite the continued intransigence of some. "The response from the private sector is encouraging," he said. Should it come down to eminent domain, but eminent domain is no longer there? EDC, while proffering hypothetical projects, does not respond to hypothetical questions. It's a bit of a tradition for newspapers to issue endorsements in political races, and so when we got wind that an architect was running for mayor, well, who else could we support? It being primary day, if you haven't voted yet, we recommend you consider casting your ballot for He Gin Lee. According to the bio on his campaign site, He "was named the 'Architect of the Year' by New York City" in 2003 and 2004 and "is not your typical politician who sees this mayoral position as a role and opportunity to win fame or satisfy personal ambitions." A profile in July in City Hall notes that the Korean-American architect has built numerous churches in Queens, many of which can be found on He's firm's website. And while our incumbent mayor has much for the design and construction of the city (for better or worse), He told City Hall that is his main reason for running: “I’d like to make a beautiful city. That is my goal.” And were he to win, he'd join some 850 fellow architect-pols nationwide. Sesame Street or P.S. 1? MOS just posted a picture of its nearly completed pavilion at P.S. 1. We'd say more, but Archinect really put it best: "Somebody Skinned Snuffleupagus." 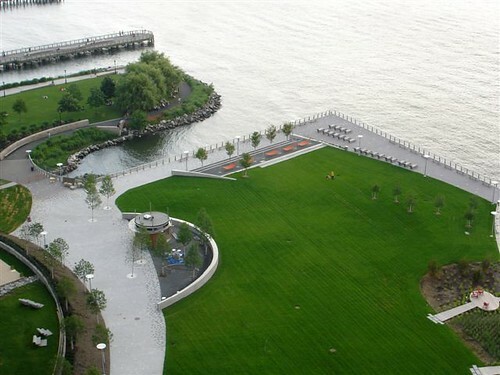 The pavilion, winner of the 10th annual Young Architects Program competition, opens this Sunday.